Pressed Juicery + Luna Bars: Most mornings, it's pretty unlikely I'll have time to sit down and enjoy breakfast, so I love being able to grab a Pressed Juicery juice and just go (more like run) to the shuttle stop. I usually reserve my Luna Bar for the return trip home -- they're so sweet, they're like little candy bar treats -- so they're the perfect indulgence and blood sugar boost I need to power through some end of day emails. Daniel Wellington watch: A classic watch goes far. I love how this particular style instantly adds a bit more polish to an outfit so if I happen to forget accessories for the day, I know I can rely on this guy. COVERGIRL Tru Blend foundation: My days run into overtime pretty quickly, with jam packed meetings and late happy hours back in San Francisco with coworkers. For that reason, I love make up routines that I can easily incorporate into my day, especially on the go. This COVERGIRL foundation provides a soft, natural finish that blends with my skin easily. Plus, it's oil-free so it won't clog my pores, a win, win in my book. Sunglasses: Because, well, I would feel naked without them. Laptop + earbuds + phone + tech accessories: You know, the usual suspects. The lighter, the better. The day I got my MacBook Air, I may have done a little happy dance. Reading material: For the times I forget to recharge my computer (which is often), I try to always have a few magazines or books on hand. Crest 3D White Strips: A few years back, my dentist talked me into trying some in-office bleaching treatments (I guess I couldn't hide my coffee habit from him, surprise, surprise). I loved the results, but since then have been searching high and low for a less time intensive and more budget friendly option. A few of my coworkers have been trying out some at home treatments so I've been eager to test out Crest's whitening strips, especially since they're easy enough to throw on while I'm catching up on emails on the bus. Thus far, I'm a fan and have already received a few unsolicited compliments from people (always the best feeling!). Notebook: I think this may have something to do with my previous life as a newspaper reporter, but I feel a bit lost if I don't have a notebook with me to quickly jot down ideas, quotes, someone's name that I need to follow up with about something, or sometimes even just sketch or two. And that's it! 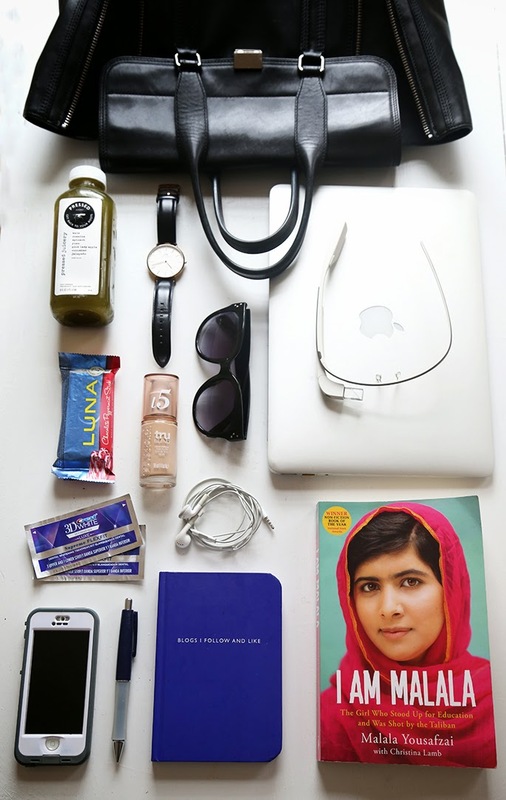 What do you pack in your work bag that helps you tackle the day? This post was in collaboration with Lucky Magazine, COVERGIRL and Crest. As always, all opinions and styling are my own. Thank you for supporting posts that keep This Time Tomorrow's doors open! I love the notebook idea. I, too always need a notebook handy and rarely rely on my phone to jot down ideas!!! Woah, wait, what? 2-hours one way? That's a ridiculous 4-hour transit time in just one day! Ridiulous! You must do crazy long hours, huh. I used to do 2+ hours each day and that killed me! You go girl. My essentials were always a good book (my favourite part about long travel hours!) and a big bottle of water. I love those sunglasses! Such a cute pair, where are they from? pressed juicery and a luna bar! yep, thats me! I don't have a book but I have my ipad which has a book! I just finished Malala's memoir. It was a very interesting read! what a lovely collection of items! I'm getting some crest white strips and I'm just wondering how good they are? Lovely post, love your bag. That notebook is the greatest! I could not agree more about the notebook - I am always writing down thoughts and lists. I have this bag and I've received so many compliments for it. It's definitely worth the money and will make a quality and unique gift for anyone.